This is a summary for McKenna from 6-6.25 years old. Things are still going well here. I have noticed that McKenna doesn’t like sweets that much. When we give her dessert, she will eat some but rarely finishes it all. It is very interesting seeing the natural differences in my children. I have one who would basically eat only sweets if I let her down to one who wouldn’t be upset if I banned sweets from our lives forever. Sleep is good. The only sleep-related issue to discuss is that since summer has started (one month out of the three for this period has been summer), I have noticed her obedience levels drop significantly if she doesn’t get enough sleep. With enough sleep, she is quite pleasant. Without enough, she will argue a lot of instructions. Playing is all good. Nothing of interest to report. She still primarily likes to play with dress up clothes when she plays. During this time period, McKenna played soccer and softball. She finished up dance lessons and had a great recital. She is saying she isn’t so sure she wants to take dance next year because she can “dance at home.” McKenna is super athletic, but not naturally incredibly graceful. She gets hurt a lot through various accidents. So dance would be good for her in that regard. I am not sure what I think about the dance issue. McKenna still takes gymnastics and LOVES IT. She super loves it. It is without a doubt her favorite thing that she does. That can definitely help teach her body control and some grace. I do worry about hitting it intensely, though. It is fine and dandy once a week, but I don’t know about getting involved heavily. I worry about stunting her growth. 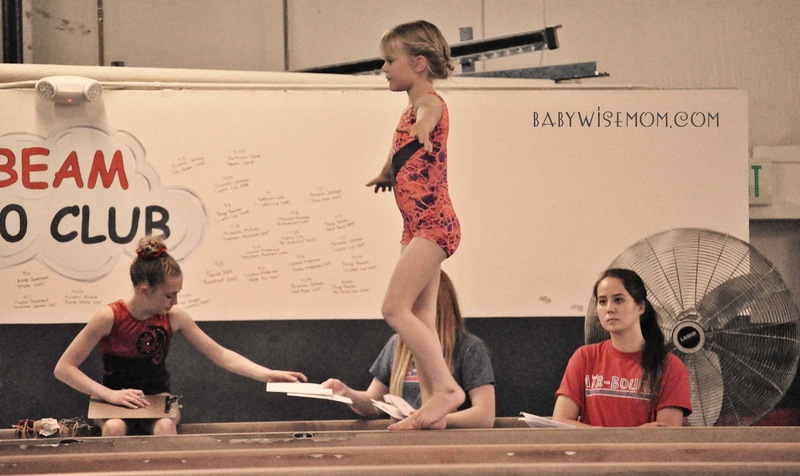 Anyone have experience in the gymnastics world and have input on that concern? McKenna is also still taking swimming lessons. Her swim teacher told me the other day that of all of my kids, she loves swimming the most. It is so funny considering the year-long battle we had with her in the pool (which in retrospect I think was caused by ear tubes). She is doing well and passing things off quickly. She just started learning her butterfly stroke and is quite good at it. 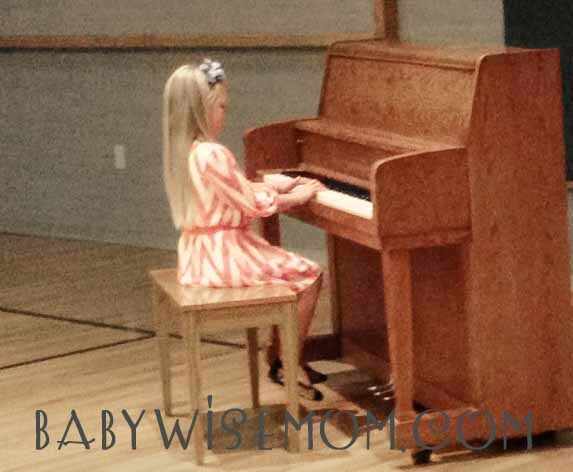 She finished up piano and did super well at her piano recital. She took on a song that was a little harder than her piano level and she practiced hard and nailed it. At her last soccer game, McKenna was running along, then stepped into a hole in the ground (why was there a hole on the field?!?) and sprained her ankle. This was a week before her dance recital. I have a good friend who is a physical therapist. She checked McKenna out. She had a minor tear. She said that research is finding to let children self-regulate. I did keep her from gymnastics for two weeks. We kept her foot wrapped up for about 5 days. I did IB Profen for two days and iced it as much as possible for two days. I let her self-regulate, but there were times I let her “self-regulate” by putting a movie on, propping her foot up, and icing it. The day after she sprained it, she was doing monkey bars and jumping down from them…so she isn’t the best self-regulator. 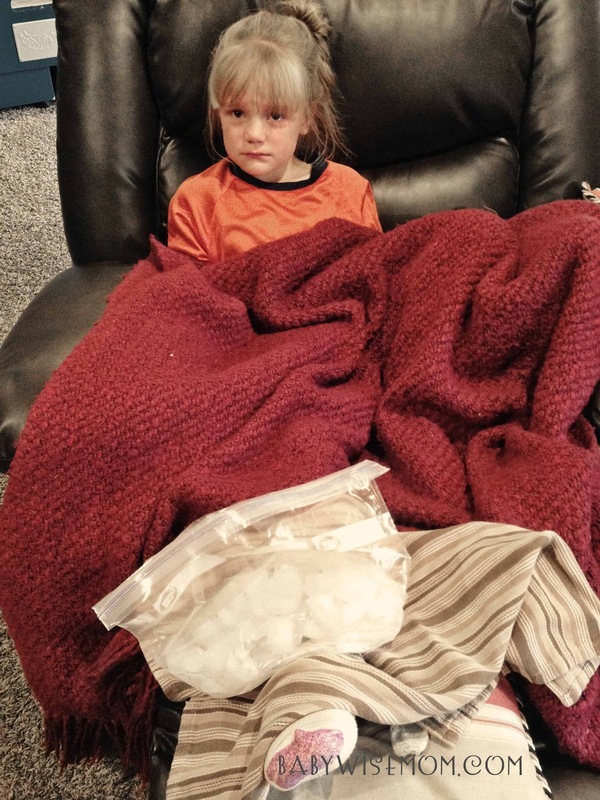 Just when her ankle swelling was pretty much down and she seemed okay, she was jumping on our trampoline with balls, landed on a ball, and re-rolled the ankle (yeah). She tried to tell me it didn’t hurt and tried her best to walk normally without a limp, but I could see in her eyes she was hurting. We had a movie day with ice the rest of that day. We also have a new rule that McKenna cannot jump with balls on the trampoline. She seems to be totally fine at this point–it has been about 5 weeks. This post contains affiliate links. I really hope this is a phase. Nurture Shock talks about it being a developmental milestone. I remember Kaitlyn having an issue with being honest around this age. McKenna will often lie to me. “Did you brush your teeth?” “Yes.” But luckily she isn’t usually a good liar–she gets a deer in the headlights look on her face. One day, I noticed a little lock of her hair was cut. I asked her who cut her hair (I am careful to not ask questions I know the answer to–it had obviously been cut. With a child who lies, you don’t want to set them up for failure). She told me one of her best friends and our neighbor had done it. I spent the day asking her about the story and how it all went down. Then I let us both sleep on it. I wasn’t convinced, but she didn’t look like she was lying, either. The next morning, I told her that I was going to talk to her friend’s mom about the hair cutting and that her friend would get in trouble. Did she still stick by her same story? Yes she did. I figured if she were willing for me to take it to that level, she was being honest. I talked to the mom. She talked to her daughter, who insisted that she hadn’t cut it, but that McKenna had cut it. She said McKenna had gotten gum stuck in her hair and cut it out. My friend and neighbor said her girl isn’t always the most honest, either, so we weren’t sure who was telling the truth. I went to McKenna and told her the friend’s story. At that point, McKenna conceded and said her friend was telling the truth. It was not exciting to me that McKenna had improved in her lying skills (though she isn’t improved across the board). I talked with McKenna about how what she did was not okay and how it had hurt several people. I told her it was unkind to let her friend get in trouble for something she had done. We went to her friend and McKenna apologized and asked for forgiveness, then I had McKenna apologize to the mother and ask for her forgiveness, as well. Since that day, she has definitely improved in her honesty, although she does still lie at times. McKenna definitely is a perfectionist and wants to never make a mistake. Her lies are often to cover up mistakes. Sometimes they are simply to move on to playing sooner (like with teeth brushing). Here is our typical schedule. I will put the school schedule here since she was in school for most of this period. My 6yr old is unsure about continuing dance as well; however, I am keeping her in it at least another year for the exact reasons you described. The muscle control and memory that will develop, I believe, will be to her benefit in the long run. We only do dance once a week and do not audition for the extra programs.